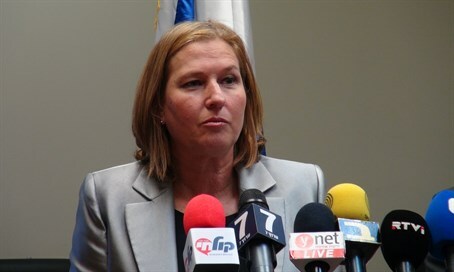 In letter to party members, MK Tzipi Livni stresses that she objects to the Zionist Union joining the coalition. MK Tzipi Livni (Zionist Union) made clear on Saturday night that she against her party joining a unity government headed by Binyamin Netanyahu. Livni added that recent attacks by members of the coalition against Defense Minister Moshe Ya'alon after he condemned the soldier who shot a terrorist in Hevron, as well as attacks against the Supreme Court, stress the importance of the Zionist Union remaining in the opposition. Livni’s letter comes after Finance Minister Moshe Kahlon said at a conference in Eilat this week that talks took place between the Likud and the Zionist Union regarding joining the opposition. Meanwhile, Internal Security Minister Gilad Erdan (Likud) warned on Thursday that the government is at risk of collapsing if Netanyahu's narrow coalition of 61 MKs - the smallest majority possible - is not enlarged soon. “The government will not be able to last much longer,” Erdan, a senior Likud member, told Army Radio. “I hope that Zionist Union or another party will show responsibility and join the government, we don't need to go to elections,” he added, warning warned that a unity government was necessary in order to pass the budget and advance the goals of the government.